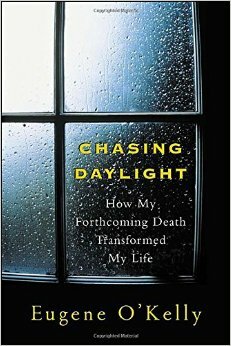 Chasing Daylight is the inspirational journal of former KPMG US CEO Eugene O’Kelly. This memoir was written in the three-and-a-half months from July 2005 to September 2005. In July 2005, he was diagnosed with terminal brain cancer and he passed away in September 2005. This book is a narration of details of his illness with reflections on life, death and success. The reader will be engrossed in this deeply insightful book and will be compelled to think about the importance of living a balanced and meaningful life. There are five prominent messages in the book for embracing death and enjoying every moment we have on this planet. The five lessons are nicely summarized in the afterword by Eugene’s wife. The ability to distinguish between what we can control and what we can’t is the key to a peaceful life. Know what you want. Before pursuing for “more”, ask yourself “what is enough?”. Consciousness is “king of virtues”. Savor the present moment being as precise and attentive as possible. This is one of the hardest things to achieve in life! For instance, while I am writing this article I am also thinking about all those people who will buy and read the book after reading this article. Our mind loves to fantasize the future or ruminate the past – escaping from the present! Focus on creating meaningful moments – where you recognize perfection in the every moment of your life. Stop looking at life through the prism of criticism and evaluation. Dedicate time to achieving balance. It’s a dynamic and collaborative activity. Reflect on your life, plan and collaborate. Eugene found a unique way to say goodbye to people who really mattered in life. 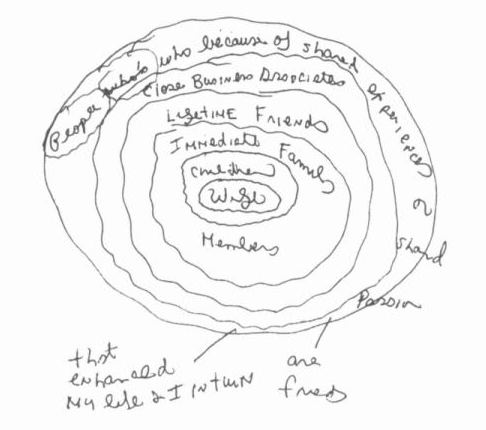 He scribbled the diagram below and went from outer circle to inner circle to bid adieu to people who mattered to him. PS : I acknowledge the picture from the internet. Yesterday I was browsing through some pages of the book ‘Co Active Coaching’ and I bumped into this fascinating exercise on turning complaints into requests. When you have your list of 10 complaints, rephrase and write those complaints as requests in another sheet of paper. Target your request to a specific individual who has the power and the control to do something about your request. In case of your complaint about the weather, you write a request to God (hope you are not an atheist). The goal is to take action on your complaints, and do what is in your control. Then, for as many items as possible in your list, actually follow through and make the request to that specific person on your list. Also remember, there are always 3 legitimate responses to your request: yes, no or a counteroffer. When I wrote the list, I had 11 items on my list. I have a busy day tomorrow at work – making requests through e-mail, phone and one-on-one conversations. I felt powerful and in control the moment I turned my complaints into requests on a sheet of paper. It’s a great tool for coaching people and helping them elevate their self-awareness and own responsibility to take action to change their destiny.